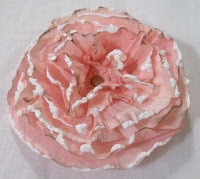 Seriously, looking at that photo, you have to be surprised that it's made from a coffee filter! So pretty! I may not have understood a word of this Swedish video but I really enjoyed listening and it's easy to understand how to make the flowers by just watching.